This presentation is going to be based on my MLitt Dissertation, which I’m currently writing up. In the wider sense, my work focuses on notions of transformative and performative philosophy and meta-philosophical questions, for the large part coming at this from an approach informed by sexual difference. So I look at issues like writing and its viability, and later I hope to widen into questions of alternative means of philosophising or performing philosophy. 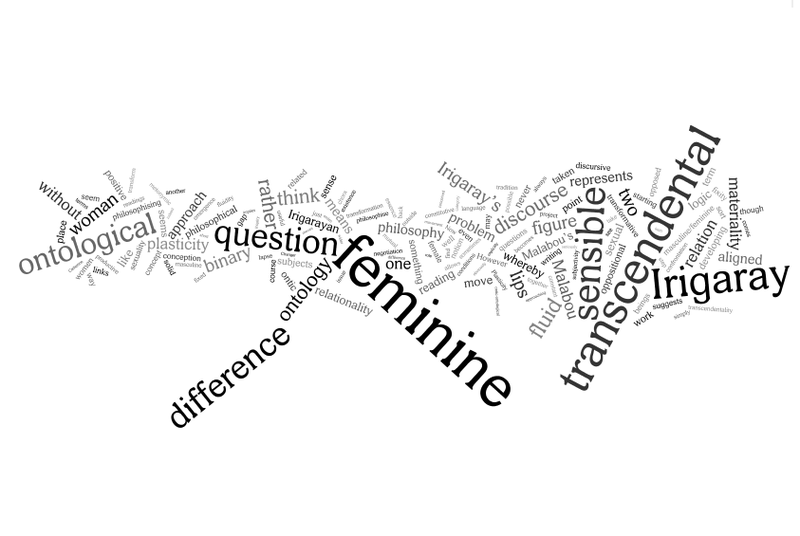 The starting point here is the diagnosis of the figure of “woman” or “the feminine” as the constitutive outside of philosophy, which is something I think it is right to take seriously, and from there to question if or how it is possible to refigure philosophy and philosophical discourse to allow for feminine participation. Ironically, this, if I get through it, will be my first fully fledged foray into the blogosphere. I am aware that writer’s block is hardly a novelty among postgrad students, and I am aware of strategies invoked to slay this particular demon. Just write a page a day! Just sit down and write anything that streams out, and reorganise it later! Or, the one nugget of advice I have encountered most often when discussing my inability to work on my MLitt thesis: just write! You’ve done all the work, you just need to write now. Now, I’ve had generic writer’s block before, but it has tended to cede to the adrenaline rush that comes with an imminent deadline. That deadline was 10 months ago, and as it stands, I have around 5k words — of 15-20k — written in an appropriate style. Technically, I should be able, if I applied myself and worked solidly, to finish up in a few days, because I’ve done all the reading, the notetaking, the thinking. The project is complete; the notions exist, it’s all done. However, I can’t just write, and I don’t know why. If I did, then perhaps I could do something about it. For the most part, it is presumably depression-related: my ability to concentrate has atrophied severely and occasionally I catch myself using a large or unusual word and have a pang of bittersweet excitement: “My brain is working! Maybe I can write today!” / “Hey, remember when I had a lexical memory?”. It’s not just the words though. I don’t remember, most of the time, what my work is about. I could give you some buzzwords, but all I have is the nouns and no linking strands; those neural pathways are dulled, overgrown, thicketed, cobwebbed. So I have subjectivity, ontology, feminism, Irigaray, the sensible transcendental, Malabou, plasticity, performativity, writing. Writing. 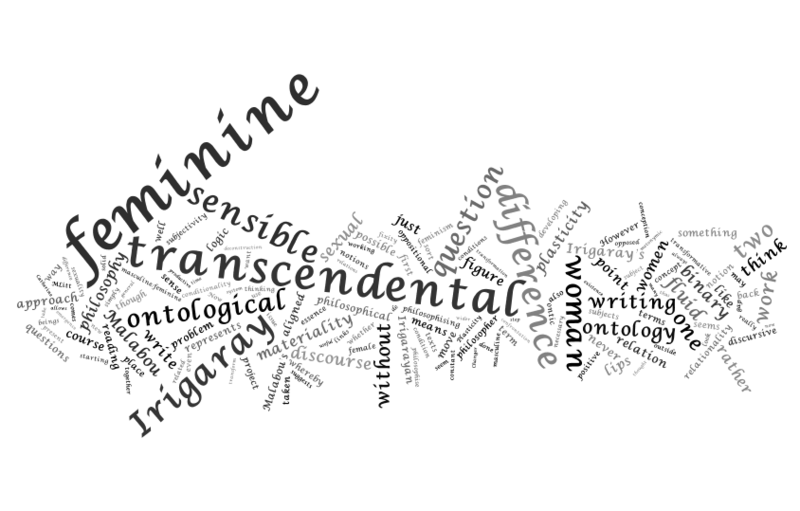 Ostensibly, the wider project concerns how to philosophise as a woman; whether this is possible; whether writing can work at all; whether other performative methodologies may be better suited. The general conclusion is that it is not really possible, within the discursive system of Western Philosophy, to be a philosophising female subject. This is a (the?) common tenet of Continental Feminism. Irigaray invokes fluid logic and a sort of transcendental materialism; Malabou seeks to get past this through a new ontological approach with its origins in plasticity. This is the general trajectory of my dissertation. The final chapter is supposed to speak of the implications of these approaches for how to write/perform/be philosophically. Sometimes, I can even remember the more complex details of it: there is somewhere I posit that materiality is the transcendental condition of transcendental conditionality itself, and that the Irigarayan sensible transcendental aims at this catachrestic moment. At the points of rupture, the conditions of discourse become tangible, and ontology itself is a discursive construct with a necessary outside — the necessary transcendental condition of materiality, which can be pulled through the cracks, and this folding together of sensible and transcendental conditionality is a way to eschew binary relations and reinstate (sexual) difference, and allow for new notions of subjectivity. I think when I got to this point in thinking through the project, I was pleased as it seemed to be a breakthrough in terms of the main point I was getting at; the hinge between all the books I’ve read and the questions I want to ask of them. But I still can’t write. Throughout the MLitt my work has been meta-philosophical, generally from this same quasi-feminist base, since I am a woman, and I do buy into the notion of the constitutively excluded feminine of philosophy. However, this new level of meta- is one I could do without. My work is about the (im)possibility of writing philosophy as a woman, and I am finding it impossible to write this work. Several notions have crossed my mind: presenting the dissertation orally; presenting it on film; writing sections asemically (cf. the Irma Blank piece above); writing it quasi-poetically; writing it with an alternative syntax that emphasises changeability, perhaps through gerunds in place of nouns; simply not writing it at all, because I can’t. These are unsatisfactory, though. None of them feel entirely apt, and besides, at this fledgling point in my philosophical career, such a move feels hubristic. Departmental guidelines, markers’ opinions, and the need to secure PhD funding in future are further factors, the stress of which feed back into the originary factor of the depression. I really want to just write it. changer de différence introduction draft translation. Evidently I don’t tend to post here so nobody reads the blog at present either, but for the sake of completeness, I’ll post this. Already posted at AUFS, I drafted a translation of the introduction to Catherine Malabou’s Changer de différence while working on my MLitt dissertation. And as mentioned over there, Polity have informed me that someone else is working on a full translation for them, so this translation is provided for academic use (personal study and classroom use) only; it is not for commercial purposes, nor for citation in any publication. Yadda yadda. Use the official one for that.